Runners who became unwell warmed up at Christ Church in Wellesley when the weather become to much to bear. Sue Ballantyne (center) from California warmed up against the fire. 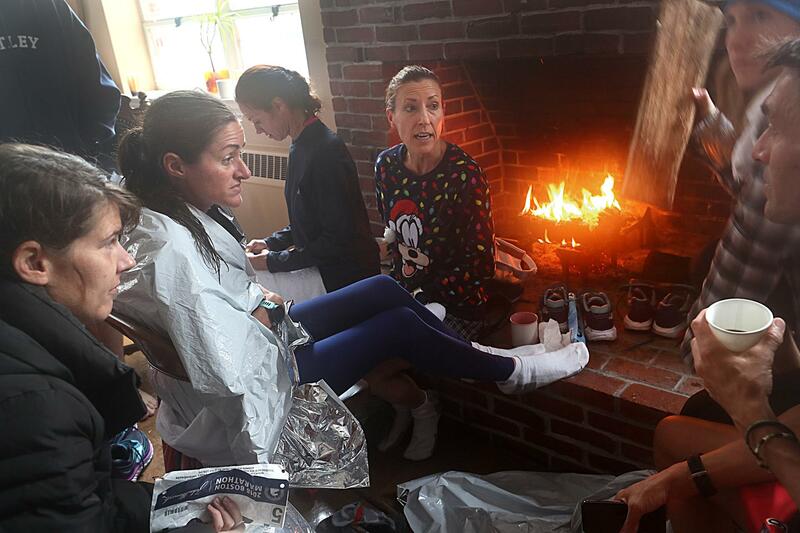 At the Wellesley church, most of the injuries were relatively minor, but the room was full of dejected faces as people came to terms that the cold, rain and wind had overwhelmed their Marathon dreams for this day. The church, based in Needham, added the Wellesley building in 2016. The gathering Monday was its first public event there. Injured runners said it started to come on a few miles in: shortness of breath, incessant shivering, and a feeling that this might not be their race. Downed runners Keaton Cervantes, Kodi Rider, Colm Quinn, ended their race in Wellesley. “Your legs are turning over but you’re just not getting anywhere,” is how Colm Quinn described it. He said the whipping headwinds were the worst part. Quinn has run many marathons and has qualified for Boston before, but the New Jersey resident has twice had to drop out before prior races because of injury. Even George Roulett of Ohio, who said he had finished 25 Boston Marathons, had to drop out Monday. Kathryn McCauley, who uses a running leg, tried to push through the pain of a blister that developed on the skin inside of the device’s fitting because of the rain. She and her running guide Susan Muller, both of Whitesboro, N.Y., were disappointed to have left the course, but they had found a couple of cold beers as a consolation. “The beer makes it a little less awful,” McCauley said. Many of the runners hung out for several hours, trading war stories, until buses came to take them to the finish line. Murphy, the associate pastor, went to Wellesley College, and had in past years been a part of the “Scream Tunnel” urging runners along as they ran past the school several blocks away. On Monday, she found herself calling something else out to the runners who entered the spiritual center. Besse had no immediate information on how many runners had sought care at the medical tents at the finish line. In a follow-up advisory, Besse said warming centers had opened in Brookline, Newton, Natick and Wellesley. Dr. Gregg Greenough, a physician at Brigham and Women’s Hospital in Boston, said medical providers are worried about the toll the weather will take on runners. “Because of the cold, wind, and rain, we’re more worried about hypothermia this year,” he said in a phone interview. Runners being treated in the medical tent at the finish line. Case in point: during the interview, he said he received word that a Marathon runner suffering from hypothermia was being transported to his hospital, which had stocked up on blankets ahead of this year’s race. The runner made it to Mile 22 before seeking medical help. “People have to really pay attention to staying warm,” said Dr. Malissa J. Wood, co-director of the Corrigan Women’s Heart Health Program at the Massachusetts General Hospital Heart Center. “When you have a lower temperature and the wind blowing against you, which reduces your body temperature more, and then rain, which lowers your body temperature even more,” she said. She said symptoms like lightheadedness, dizziness, shortness of breath, chest pains, and feeling like you may pass out are all serious. “That’s the type of thing you really don’t push through,” said Wood. So were Monday’s conditions a worst-case scenario? Wood, who’s run the Boston Marathon three times, said, from her recollection, today doesn’t seem as bad as 2007. The medical tents at the finish line were also hopping. The designated heat room was reserved for only the most severe cases, but runners were only given limited time in the room so volunteers could accommodate others who were shivering and crying when they approached. At least one runner was taken from the tent on a stretcher due to severe hypothermia, while another was sent to her room. 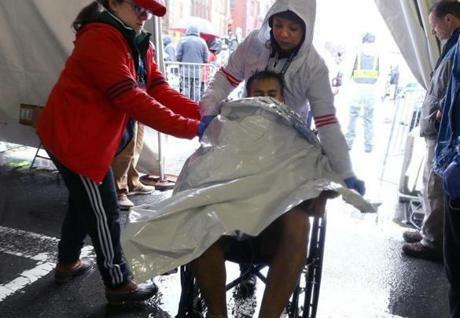 At the tent’s exit, a line of runners in wheelchairs awaited their families as they wrapped themselves in space blankets. “The best one can hope for today is a cold. These are difficult conditions,” said Felicia Bennett, a medical volunteer.